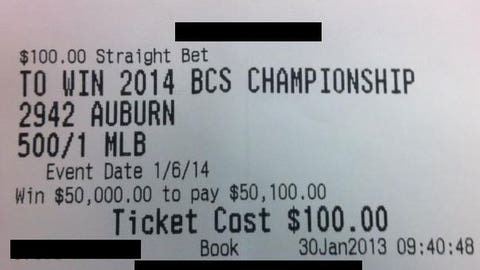 Earlier today, the Buzzer told you about Mark Skiba, who risked $100 to win $50,000 in January on Auburn winning the national title this season. The Buzzer reached out to Skiba, who went to Auburn (class of 1998) to ask him a few questions about his wager. The Buzzer: What made you place the wager? Skiba: I placed a similar wager back in 2010. The stakes were just for a lot less — 100/1 — and I only bet $10 almost as a joke. Keep in mind that wager was made back in February 2010 before anybody even knew who Cam Newton was. Fast-forward to present day: My parents were out in Vegas earlier this year, and my Dad calls to tell me we’re listed at 500/1. This time, I figured I needed to make it worth my while and told him to put $100 down. He said I was crazy. The Buzzer: When did you think you may have a chance to win the bet? Skiba: After the A&M game, when you sat down and looked at our remaining schedule, you could see that we had a good shot at going into the Alabama game with only one loss. The A&M game was definitely the turning point in the season. And the thought was, if we could just get to that game (Alabama) with only one loss, who knows? Anything could happen. The game was going to be at home, and we’d have the week off prior. In the meantime, everything that we needed to have happen in front of us was happening — Stanford and Oregon both losing twice, Oklahoma State beating Baylor, etc. Then there was the Georgia game. For that game to end the way it did, you start to think about mystical words like destiny and fate. And now we have the Alabama game. That’s destiny and fate on steroids. All in all, it’s been the perfect storm over the last four weeks or so. A lot of things had to happen that nobody thought would in order for us to be where we are now. And we still need a couple more things to go the right way to end up in Pasadena in January. But either way it’s been a fun ride. The Buzzer: Do you gamble regularly? Was this just a random thing? Skiba: No, I don’t gamble regularly. There is a reason why casinos are really big and nice. The Buzzer: If Auburn loses to Missouri, would you rather they would’ve just lost to Alabama instead of dragging this out a week? Skiba: No offense, but that may be the dumbest question I’ve ever been asked. Google "Iron Bowl" and let me know what you think my answer is. The Buzzer: Whom do you want Auburn to play in the national title game? Skiba: I have no real preference, but I’ll say this: It would be very, very interesting if both Ohio State and Florida State lost this weekend. Funny side note: After the loss to LSU, I almost tore the ticket up. Still don’t know why I didn’t. Maybe it was destiny telling me not to. The Buzzer: Do you know what you will do with the money if you win?